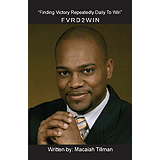 This book will help readers to understand through life experiences, education, and spirituality there is encouragement for everyone to find victory repeatedly daily to win. It is a process, it is about science through the law of attraction, it is about life education, scholastic education, and it is about spiritual belief. Macaiah is delivering a high energy message which tells people how to go to their destiny and live up to their dreams. We all have the favor to win but one must tap into it. Are you willing to turn the pages? Macaiah has a powerful message on the Favor to Win that changes lives of people across the nation. As an Entrepreneur, Author, and Motivator, his deliverance inspires, excites, and creates a passion for life and business in a unique way. As a well-known professional speaker and author, Macaiah has risen from child abuse victim and life challenges to becoming victorious. At an early age he witnessed the brutal beating of his brother who nearly died and later the life of his mother living from one abuse shelter to another. Today Macaiah would have been considered a child “at risk” being a product of a single parent and life challenges. However, he would say, “not so,” because he realized at an early age the power of choice.